On Super Bowl Sunday, I posted this photo on Instagram of a spiralized dish that my mother brought to eat during the game. I must have receive a hundred messages on Instagram and Snapchat about that dish, so I called my mother first thing Monday morning and had her walk me through the recipe. Now, it’s on the blog! And because I had about three servings, let me tell you: MAKE THIS. I had actually never baked sausage in the oven before, but now, I don’t know how else I’ll ever cook it (aside from crumbling for a lasagna like this one.) The sausage cooks evenly (just shake the pan a couple of times while it cooks) and voila – crisp on the outside, perfectly cooked on the inside. 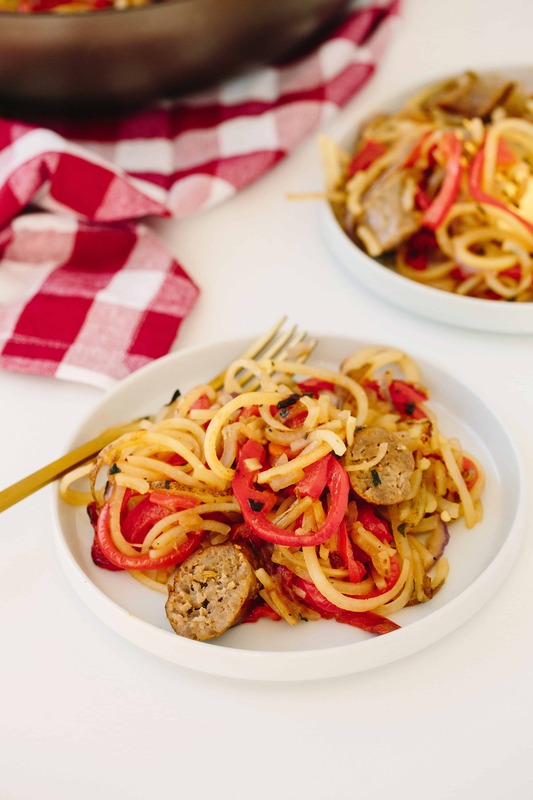 I used sweet Italian fennel sausage in this recipe, but you could omit the red pepper flakes and use spicy sausage. 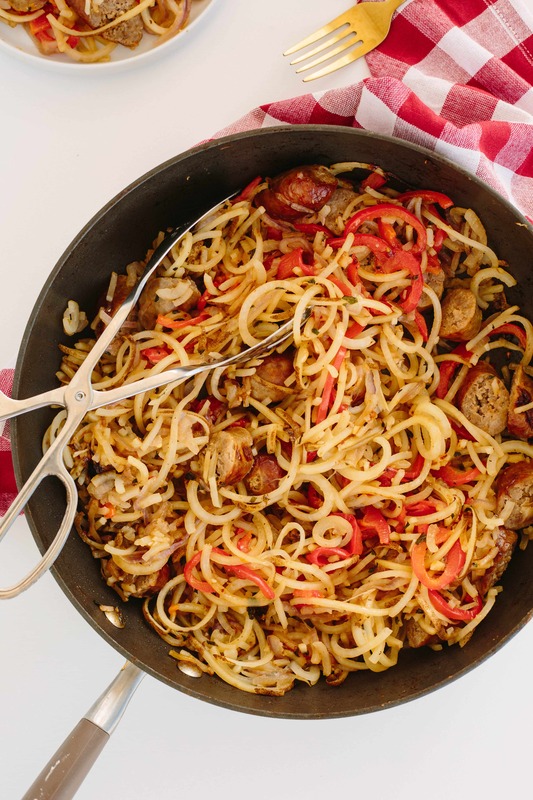 OR, do a combo – sweet and spicy sausage. And if you’re not a meat-eater, just toss in some chickpeas or quinoa, because the flavor from the potatoes, peppers, onions, basil, and oregano are all you need! This dish saves well, too – you can even freeze it, it will all defrost. So thanks to you Mom, for sharing your recipe with everyone – I know you read my blog everyday, so I’m sure you’ll love this post the most! Stay tuned tomorrow for another “What I Ate Today” and a #livinginspiralized feature. I’m answering another one of your questions! Preheat the oven to 425 degrees F. Place the sausage in a baking dish and bake for 20-25 minutes or until sausage is browned and cooked through. Meanwhile, heat the oil in a large skillet over medium-high heat. Once oil is shimmering, add in the peppers, onions, and potatoes. Season with red pepper flakes, oregano, basil, and garlic. Season generously with salt and pepper and toss well to combine thoroughly. Cook the mixture until potatoes are cooked through, about 15 minutes. If you want to speed up the process, cover the skillet with a lid to let the mixture steam. 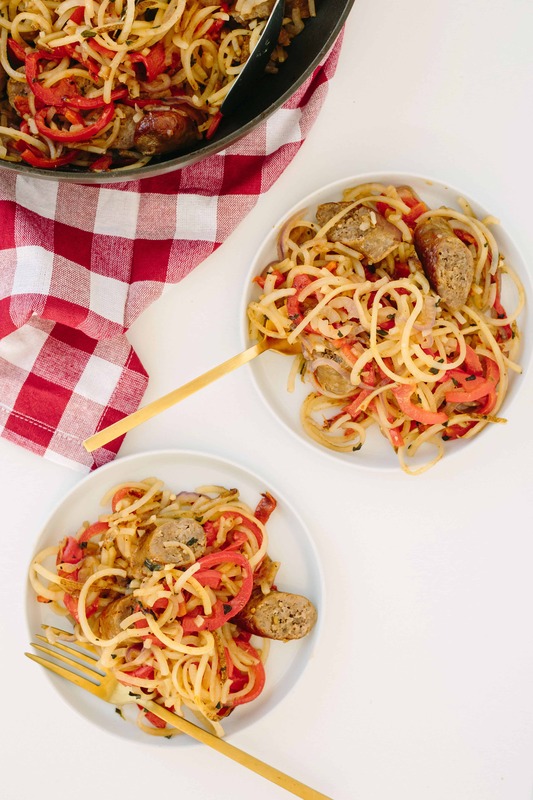 When the veggies and sausage are done, slice the sausage and add to the veggie mixture and toss to combine OR simply serve the sliced sausage alongside the veggie mixture. Yum!! Love the roasted chickpeas idea. I use the Anolon pans but haven't tried the bronze one. Macy's often has a sale on these or a coupon you can use for them . My Mom always made her sausage and peppers with potatoes as do I. Her recipe was very similar to this one (nothing was spiralized however). She sometimes added a splash of balsamic or red wine in her recipe and then put it in the oven to finish. Thanks for sharing. This sounds so very tasty. I will use rutabaga instead of potatoes to keep it lower carb since I enjoyed your rutabaga spaghetti recipe so much. Thanks so much to you and your mom for the recipe! Love this! What sausage did you use to calculate the Weight Watchers Smart Points? I'm struggling to get it down to 6 points. Thanks for all you do! Love your recipes and the spiralizer! Made this yesterday and it was delicious. Sprinkled some grated cheese on the top and that finished it off beautifully! Hello, this looks delicious! :) Is your smartpoints calculation based on 4 servings or 6 servings? Hi, Made this for dinner last evening & it was delicious. Have enough leftover for my dinner this evening. Will make it again. Made this for dinner tonight! YUM! You weren't kidding about the clean up after spiralizing bell peppers! I substituted one potato for a sweet potato because I didn't have enough (might have liked it better this way?). I also ended up putting the potatoes, onions, and peppers in the oven for a bit because I didn't love how liquidy they were getting in the pan. Best way to cook sausage in the casings ever! Made this for dinner tonight, and everyone loved it. Thanks! That's awesome to hear. You're so welcome. We're glad you enjoyed the dish. Oh, that would be fabulous! Do you know what size your blades are? My spiralizer goes by mm not letters so I am uncertain what size to use. Thanks!